Dániel Hamar was born in 1951 in Budapest, Hungary. He started to play the piano when he was seven and took up the classical double-bass at fifteen. He became a member of the Symphony Orchestra of St. Stephan Grammar School, and although this orchestra was considered to be amateur, the best Hungarian soloists and conductors performed with them, and many of its young musicians became professionals. Hamar started to play traditional Hungarian music when he was 22. As was the case with almost all classically- trained musicians, Hamar knew little about traditional Hungarian music until he began to play it. He visited remote Hungarian villages to learn the old techniques of playing, and established the group Muzsikás with his friends Sándor Csoóri and Mihály Sipos in 1973. 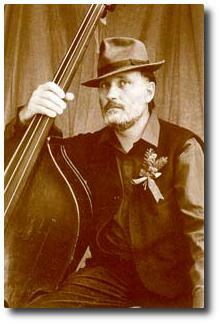 Hamar plays double-bass and percussion instruments in the band. He is the spokesman for Muzsikás and the official leader of the band. Dániel Hamar graduated as a geophysicist from the Eötvös Universityin 1974 and earned a Ph.D in 1994. He is asenior research fellow of the Space Research Group of Eötvös University, Budapest. Dániel Hamar is married and has four sons.